If your company needs pallets of ice melt consider our deicing solutions that provide the solutions you need to keep your business functioning optimally. We provide environmentally-friendly salt solutions for companies of all sizes. Our high-performing salt products provide effective ice-melting capabilities while reducing the impact on the environment. Our road salt, rock salt and ice melt line of products provide all of the options you need to run your business successfully. There are 3 commonly used deicers on the market which include rock salt, calcium chloride and magnesium chloride. You may want to keep a generous amount of each type in stock since they all provide their own types of benefits. Rock salt is a mineral form of sodium chloride and can melt ice and snow by forming a brine that lowers the water’s freezing point. It’s only effective down to temperatures reaching 5°F, however, which is why you may need to stock up on the other options as well. Magnesium chloride is usually available as flakes and can work on ice and snow in temperatures reaching down to -5°F below zero. It also produces a brine that melts the snow and ice and stops further ice and treacherous conditions from reforming. Calcium chloride makes a brine as well, just like magnesium chloride and rock salt, but it can work when temperatures plummet down to -25°F. It also offers faster melting capabilities and for this reason it’s a good choice for contractors working in areas where hazardous conditions appear in brutally cold temperatures. Our bulk road salts are available at reasonable prices and you can take advantage of our bulk discount pricing. We can provide sand mixtures that can help with traction along with the ice melting properties of the salt. We also offer deicers that are environmentally friendly, which are perfect for contractors that embrace green solutions that customers appreciate. When the temperature drops our ice melt products deliver. We have different options available that correspond to different weather conditions and temperatures. We also have ice melt solutions available in pallets for different surfaces including parking lots, streets, porches, patios, concrete, interlocking walkways and driveways, steps and sidewalks. Your customers are putting a lot of trust in you to keep their properties safe and sound and to stay in business and obtain more customers you need to provide the best services possible. We can help you do that by providing you with the salt you need to keep your customers satisfied. Ice melt consists of treated salt that allows it to work faster than traditional rock salt. This ice melt is perfect for colder weather conditions when a fast-acting ice melt is required. 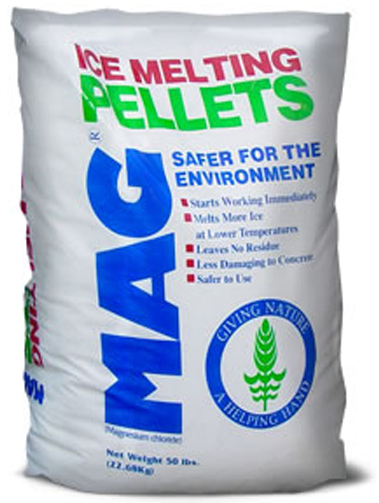 Our ice melt is available in convenient bulk bags for homeowners and contractors that don’t require larger amounts and on pallets for larger companies that always need an ample supply of ice melt available.